Welcome back, dear readers! Today, we’ll continue exploring Blairsden: the Mansion in May for 2014. Today our tour takes us into the main hall of this architecturally significant Beaux-Arts gem. Gacek Design Group is responsible for the decoration of this space, with its carved French limestone, elaborate symmetrical details and grand archways. Richard Gacek chose to place an emphasis on the pastoral setting of this amazing, legendary estate. Multiple seating areas enhance the long Main Hall at Blairsden. Beautiful gold, overscaled lamps and an impressive landscape oil painting set the tone for this room. The contemporary area rug helps define the grouping and adds a pop of color to the otherwise neutral space. 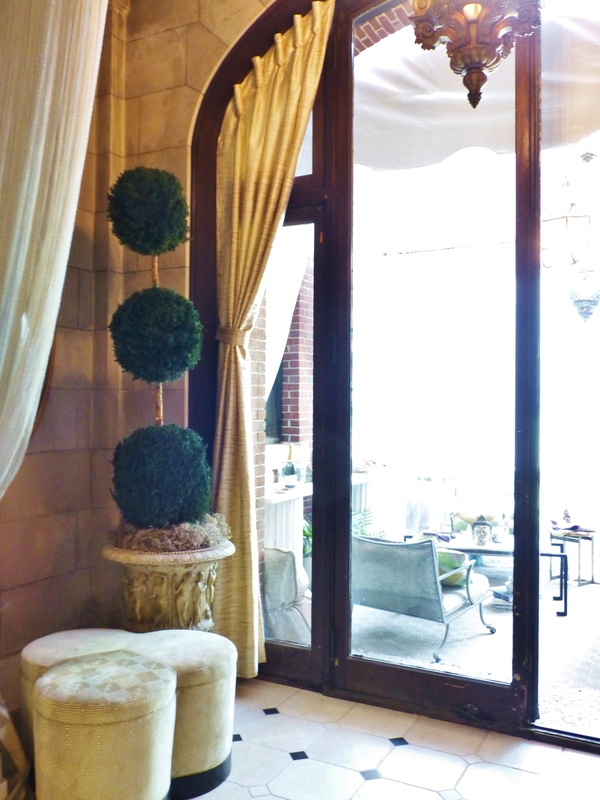 It also coordinates beautifully with the adjacent skirted table in the Main entry (by Megan Young Designs). First, let me just say that this Main hall is QUITE large. It’s actually several spaces, in a long cross hall with 14-foot ceilings having elaborate plaster moldings and pilasters. Mr. Gacek transformed the space into a restful open-air woodland, where you can be reminded of nature’s beauty with light neutral and metallic fabrics. Moody gray and silver tones, dreamy cloud-like whites, and soft metallic fabrics are used to give movement and life the space. 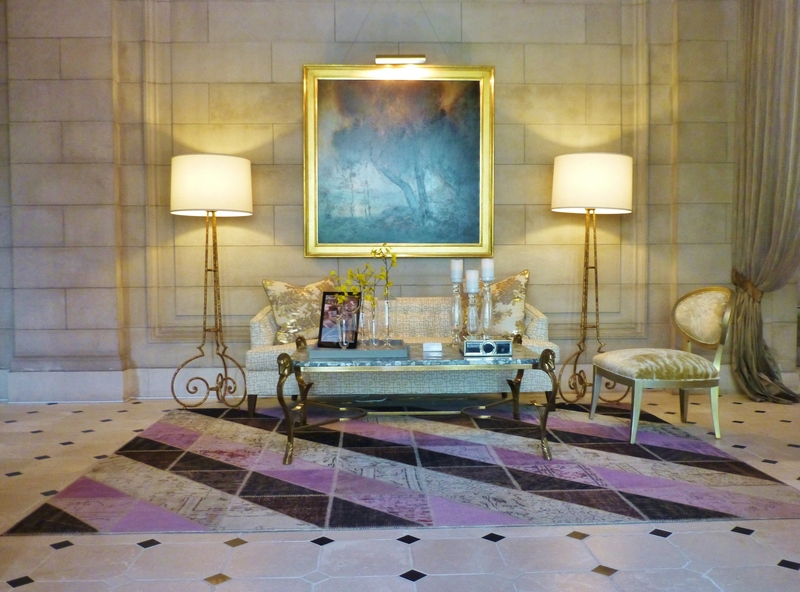 Each alcove was treated with the respect it deserves with custom draperies, furnishings, artwork and accessories. Notice the beautifully shaped and pleated panels on this French door. The many different fabrics in Mr. Gacek’s area are from both Robert Allen Fabric and Maxwell Fabrics. They are all just beautiful and there is such variety–at the entrances to each seating area are tall sheer portiere’s, and each alcove has draperies at the French doors, plus the tall columnar pillars at the base of the stairwell. I’ve included some detail images below. A combination of 2 fabrics are used on these billowing floor-to-ceiling panels. 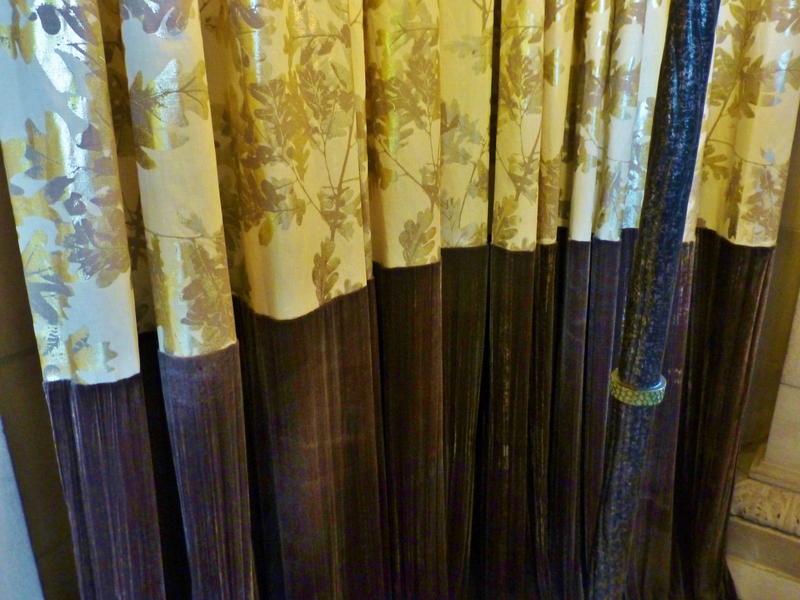 Observe the metallic tree Oak-leaf pattern of the top fabric, and the velvety bark-like texture of the lower portion, which puddles in a root-like manner. Take notice of the hammered metal of the lamp-post, while you’re looking. The billowing floor-to-ceiling draperies lend a tree-like quality to the bottom of the main stair. Don’t miss out on the custom shaped drapery hardware at the top…just perfect! This beautiful photograph shows the expansiveness of the Main Hall and all it’s various spaces. Mr. Gacek did an amazing job of furnishing and softening this expansive area! This image can be found on the Facebook page of Gacek Design Group. Here you get a sense of the vast scale the Main Entry has with all it’s separate areas. It’s extremely beautiful! Kudos to Mr. Gacek’s photographer: Halkin Mason Photography. Please take the time to leave me a comment about the spaces featured in this week’s blog–did you love the stone work and the naturalistic feel? Stay tuned for much more about the rooms in Blairsden: The Mansion in May. Until then, please tell everyone you know about Kristine Robinson’s Blog, I need all the friends I can get! 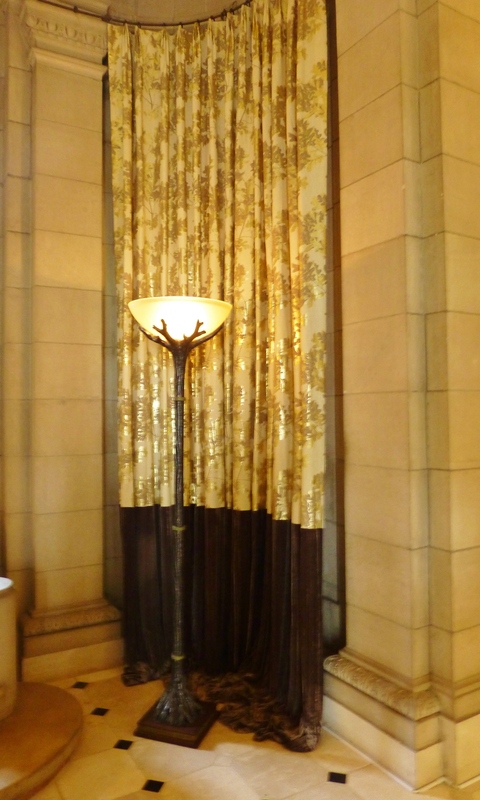 This entry was posted in Architecture, Designer House, Interior Design, Uncategorized and tagged Decorating, Draperies, Historic, Home Decor, Interior, Interiors, Mansion in May, rugs, Walls. Bookmark the permalink.